During the 1917 Russian Revolution, Leon Trotsky acted as a key lieutenant to Vladimir Lenin. Trotsky organized the Red Army and successfully resisted all attempts to overthrow the fledgling Communist government. One of Trotsky’s bitterest enemies was Joseph Stalin, another intimate of Lenin’s. When Lenin died in 1924, Stalin outmaneuvered Trotsky for leadership of the Soviet Union. Airbrushed from photos showing him sitting or standing close to Lenin. Written out of Soviet history textbooks. Depicted, in print and documentary films, as seeking to overturn the Revolution—and assassinate Stalin. Stalin made certain his image in Soviet history was entirely different. In the 1930s, he was portrayed as the modest, all-wise, energetic builder of a new Communist world. After 1945, he was depicted as the architect of the Soviet victory over Nazi Germany during World War II. For almost 30 years, through purges and starvation caused by enforced collections of farmers’ crops, he had slaughtered 20 to 60 million people. His wholesale purges of the Red Army in the 1930s had made the country vulnerable to the German attack in 1941. His 1939 “nonaggression” pact with Germany had almost destroyed Russia. In this he and Hitler secretly divided Poland between them. The subsequent German invasion of Poland, on September 1, 1939, directly triggered World War II. After Stalin died on March 5, 1953, his status in Soviet history suddenly changed. Thousands of his portraits—displayed on streets and in buildings throughout the Soviet Union—suddenly came down. In 1956, his successor, Nikita Khrushchev, secretly denounced him as a psychotic butcher and bungler who had almost wrecked the country. So those Americans with a sense of history were undoubtedly stunned at President Donald J. Trump’s reaction to the defeat of Republican Senatorial candidate Roy Moore on December 12. He had twice been removed as a Justice from the Alabama Supreme Court. He had said the United States should eliminate all but the first 10 Constitutional amendments. This would remove those amendments forbidding slavery and guaranteeing civil rights for blacks and women. Worst of all, Moore was haunted by allegations that, as a prosecutor during his 30s, he had made sexual advances toward at least eight teenage girls. 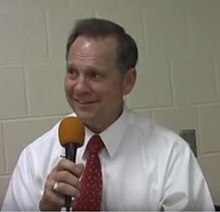 Many Republicans openly urged Moore to withdraw. They saw him as a nightmarish embarrassment to their party should he win the election. But that didn’t stop Trump supporting Moore full-tilt against his Democratic opponent, former United States Attorney Doug Jones. Jones had convicted Ku Klux Klan members for bombing a black church in 1963. Then—for Trump—the unthinkable happened: Moore lost. Jones received 49.9% of the vote; Moore got 48.4%. Suddenly, Trump was rewriting history.